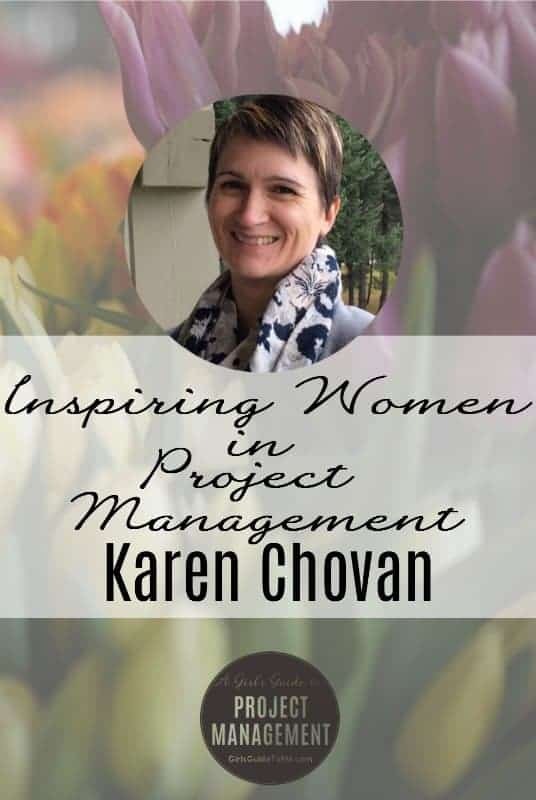 Today I’m interviewing Karen Chovan, MASc, PEng, PMP, who has dedicated her career to helping others deliver clean, lean and green approaches to project and programme management. Karen started out in heavy industry – mining – and is now Principal at Enviro Integration Strategies, a firm that helps companies get tangible value from doing the right thing for the planet. She’s inspired a ton of businesses to shake up how they manage their projects. Will she inspire you too? Let’s get started! Karen, your background is in mining. Are there many women in your field? In mining in general, you might be surprised how many women there are but it is still much less than other sectors. In the most recent Canadian survey by the Mining Industry Human Resources Council, results indicated women represent 17% of the Canadian mining workforce. However, in the fields related to sustainability, environment and earth-geosciences, safety, health and community engagement, there are quite a few women. I don’t have stats on this specifically, but I’d venture a guess of close to 50% on average, which was about the case when I was in school many years ago in geological engineering. 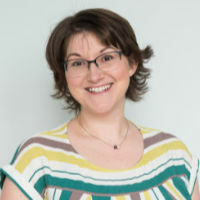 On the project management side, you’ll often see many female project managers involved with managing the environmental assessment and regulatory processes and supplementary programs for monitoring performance and oversight. After high school, I delved into architectural drafting, then geological engineering, dam construction management, environmental impact studies and managing field activities to support that, and lastly a full dive into the broader realm of sustainability and it’s application to industrial developments and organisational change. In my past corporate role I was part of a team managing organisational change integrating sustainability throughout the business. We worked on every stage of the initiative, from initiation and planning through to all the facets of execution, iterative review and expansion of the program over time with each success. A lot of my focus ended up working with the PMO to improve the process of identification of risks and opportunities, trade-off analyses, decision making, and stage-gate reporting for improved performance in environment, safety and inclusion of external stakeholder needs. So how did you get into training project managers about sustainability? I also did a lot of mentoring of team leads and also played a role of major project oversight too (to facilitate identification of options to consider, to support decision making), both of which led me to realise the gaps there are in understanding how to systematically incorporate aspects like sustainability. When I refreshed my PM training after leaving the corporate world, I also realised how, within the standard training, little content is focused on these topics. I knew I could add a lot of support to project managers that needed to gain that knowledge. My venture into providing this training is still relatively new, but it has been well-received! Is project management getting more aware of sustainability? In some circles, I would say yes. There is a major shift of manufacturing and industrial companies in moving towards sustainable practices. The mining industry has been steadily progressing in this direction too, at least within the larger organisations, and particularly on the social front. I truly believe it will become the norm for all proposed developments in the next 5 years or so, and I believe these skill sets will be much in demand. Is it fully realised in all industries? No, nor it is likely to be for some time. It will be picked up by project managers who work in industries where potential environment and social impacts might have be associated with their projects, although argumentatively social impacts could be had with most anything these days, depending on how you view the project! What trends are you seeing in training in this area? An organisation I’m now a training partner for, GPM global, offers an entire certified sustainability-embedded project management training programme and this is being picked up around the world. They are perhaps an advancing competitor for PMI, but also offer complementary training that will provide the sustainability-related integrations required for those who already hold a PM degree, or have extended experience in project management and don’t require these fundamentals. In North America, the uptake has been slower paced – there are still only a few trainers in the USA, and I am the second trainer in Canada but I presume this will change. That’s interesting. What about wider changes in how projects are managed? There has been an increase of sustainability related articles, blogs, discussion forums and even a few smaller conferences focused on how to integrate these aspects, a sharing of lessons learned on the topic. Some educational programs are bringing sustainability into project management degrees and there is more focus on it by engineering programs, at least in part. Some educational programs are bringing sustainability into project management degrees. Project management organisations are also more aware. One of the recent IPMA updates saw sustainability added as a core competency for project managers. Some ISO standards have also recently introduced the concepts of risk-based and lifecycle thinking in the management system requirements, and a lot of industrial-based companies are starting to demand this support, so more project managers are becoming aware of it. So it’s all changing. What is your biggest challenge in your career right now? Figuring out exactly what people want. And since I’m still building this ship, I’d say just getting my name out there, and finding those who want or need this type of training and of course having that occur when I’m ready for them too! I believe in the philosophy of lean, and as such am proceeding in a slower fashion because I want to be sure that the efforts I put in are in the right place, and can help the most people – why develop content that no one wants, right? Definitely! What advice do you have for women in project management who want a similar career path to you? You really can do whatever you set your mind to, so long as you put in the work. And never underestimate how the smallest connections you make might come back to you – in a positive or negative way – always put your best self forward. I’d say know what you’re passionate about, and place value on all of the skills you’ve developed from every position you’ve ever held. Including those waitressing jobs, sales positions or less exciting, laborious things you’ve done. You have picked up important skills at every stage, and you just need to recognise them, and share that with others. Don’t sell yourself short, don’t ever let someone tell you what you can’t do. 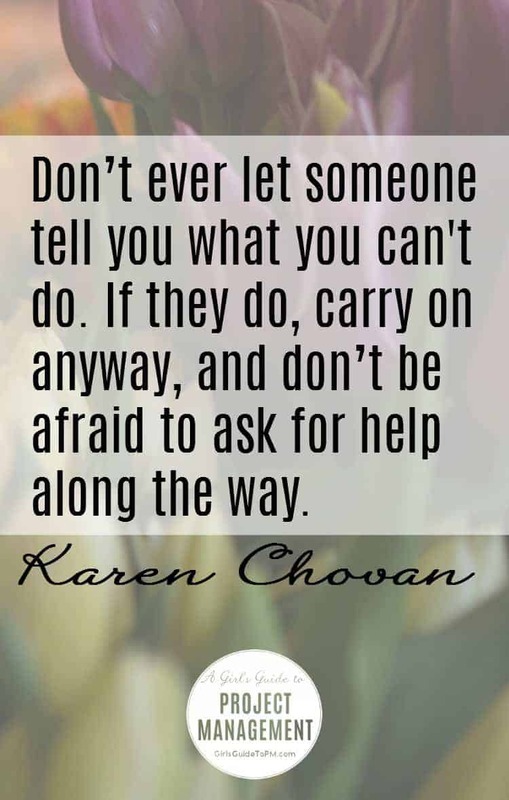 If they do, carry on anyway, and don’t be afraid to ask for help along the way. What’s the one thing you wish you had known when you were starting out? When starting out in the workforce? I guess, knowing that I would continually learn, and that my goals and interests would shift so much over time – sometimes fairly rapidly. I grew up in an entrepreneurial family – restaurants, catering, and plumbing and fully learned each of those businesses. From that, I decided I never wanted to be in business for myself, ha ha! Now I’m teaching others from my experience, as an entrepreneur! I really am appreciative that I gained so many business skills at a young age, but I’ve still a lot to learn myself! I just wonder what will come next. If you are interested in learning about sustainability, lean and lifecycle thinking, and how to incorporate those into managing projects, programs, portfolios, or organizational strategy, Karen is happy for you to get in touch via her website, Twitter or LinkedIn. You can also download her free sustainability ebook and checklist. Great interview! I love Karen’s point regarding valuable skills developed throughout one’s career – even the early jobs. There’s something beneficial to be taken from each of them.